Public notice regarding Hoarding of banners or any other advertisements within JMC Limit. 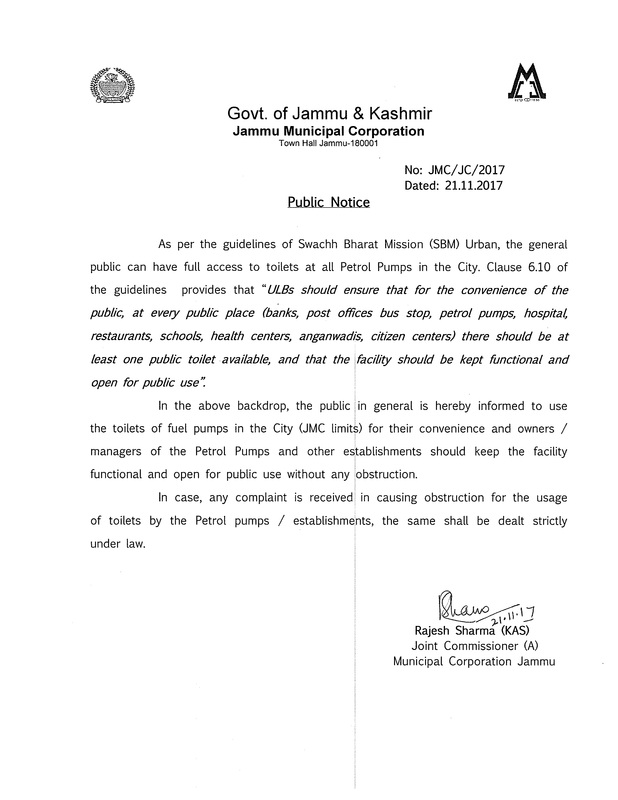 Public Notice Regarding Disposal of wastes from "Bulk Waste Generator" within JMC Limit. Information for Public & the Professionals/Consultants regarding Building Permission Process. Public Notice regarding municipal land allotted to Dr. Nirmolak Singh S/o Sh. Inder Singh. OWP No. 1766/2016 & MP No. 01/2016 titled Sham Lal & Ors. V/s State & ors. Notice regarding use of idols made of plaster of paris during festivals like "Ganesh" & "Durga Puja"
Notice regarding installation of Hoardings/banners/posters etc. on Buildings/Bridges/Hospitals within JMC limits. Public Notice regarding Registration of Street Vendors/Hawkers (Rehri wallas) within the jurisdiction of Jammu Municipal Corporation. Reconnection of Street Lights/Luminaries disconnected by Power Development Department. Rates for organizing various shows, exhibition, circus etc within JMC limits. Circular regarding disposable items made up of thermocol, Styrofoam, styrene, plastics, acrylics etc. used by hotel/Restaurant owners/banquet halls/apartments. Notice regarding Collection of Labour Cess under the provisions of "The Building & Construction Workers Welfare Cess Act 1996".